Do not leave this page until you have checked out our Medium Rectangular Cans! You are going to love the new metal party favor containers. 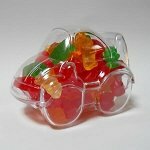 They are stylish and offer a 12 ounce capacity for you to showcase such materials as candy mints, chewing gum, snack nuts and more. 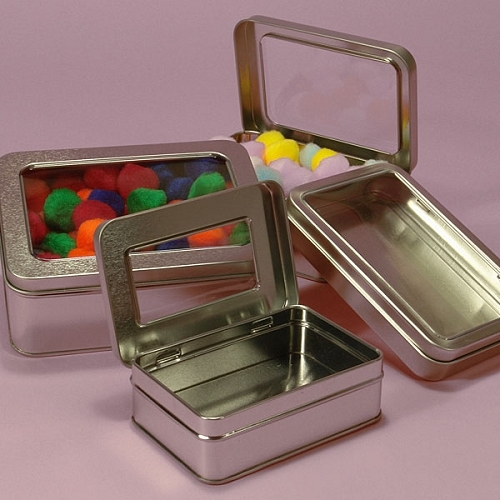 Our rectangular shaped metal tins are the perfect way to showcase your candy or give away as a gift filled with your choosing. 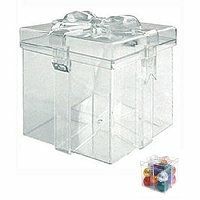 Each candy container features hinges on the lid and is made of 100% steel so you are getting one quality product. With the window top, these canisters are popular during the holidays with color matching sweet treats or candy hearts saying "I Love You." Or add to birthday parties or receptions filled with treats for guest to take home. Order today to take full advantage of the fabulous price! Please Note: **Does not have an internal plastic lining, therefore caustic substances may cause the steel to rust.